Some background: Within Temptation is a Dutch hard rock/symphonic band founded in the mid-90’s by vocalist Sharon den Adel. The band has released five albums and has constantly shifted among several styles such as gothic metal, symphonic metal and symphonic rock, with pop sensibilities ever-present in their incredibly catchy and enjoyable songs. Although this band is not popular in the U.S., they play to sold-out crowds in their home country and many other European countries. Often compared to Nightwish and other similar female-fronted metal groups, their success rests almost entirely upon the shoulders of Sharon den Adel, whose incredibly diverse voice is one of the most unique and praised in the European music scene, even though she lacks much formal training as a singer. Their last album, The Heart of Everything, released 2007, broke into the United States Billboard charts, as did their latest album, the concept album The Unforgiving. 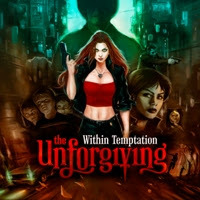 The Unforgiving is a huge stylistic departure from the usual style of the band, and thus will naturally divide the fans. Instead of the celtic-influenced, typically heavy yet simple and (sometimes overly) bombastic, with lyrics about nature or fantasy that they became beloved for with their 2000 album Mother Earth, or the softer symphonic ethereal ballads of their 2004 effort The Silent Force, or the varied, “Evanescence-y” pop/metallic, yet slightly weaker The Heart of Everything, this album is clearly eighties-rock inspired, packed with fast, heavy, extremely catchy songs with poppy hooks and distorted, powerful guitars. The story of the album follows a mystical gang of undead avengers who “take a stand against evil” to repent for their own misdeeds, led by the mysterious Mother Maiden and starring protagonist Sinéad Harkin, also known as “Queen”. This complex and oft-confusing tale is expanded upon in several accompanying short videos and a soon-to-be released comic series, created simultaneously with the album (quite a multi-media project indeed!). (Yes, it is absolutely convoluted and hard to follow. I have only gleaned this much information from watching the videos, looking at the comic and reading about the story of the album specifically.) However, for someone who has no desire to try to follow the story, the album itself is still immensely enjoyable, as it is one of the band’s strongest albums yet. Essentially, for fans that loved Mother Earth and the more gothic overtones of the band, I would not recommend this album. For a more open-minded fan, or any music lover who appreciates more poppy and eighties-style rock, I would strongly recommend this as an album to get into the band with. Every song (with the exception of the entirely spoken introduction “Why Not Me”, featuring Mother Maiden), is extremely tightly and well-crafted, with strong hooks and vastly improved instrumentation. On previous albums, the enjoyment lay almost entirely with den Adel’s singing, since the rest of the band played exceedingly simple and sometimes grating background chords and beats to her voice, and was generally drowned out by the orchestration. The formula was basically den Adel with a simple drumbeat, some layered piano on top, orchestration and synthesizers, and then maybe some guitar or bass in the background, chugging away for those who care to listen hard for them. However, on this album, the quality and proficiency of the song composition and instrumentation is infinitely improved, and there are strong guitar solos and fast drumbeats galore, with the orchestration and choirs reined in the perfect amount so that they don’t drown out the band. Each instrument, in one song or another, gets a chance or two to shine (except the virtually inaudible bass, as is often the case—it must have gotten buried in the mix). This album may be the best collection of individually strong and consistent songs that the band has yet released. The best songs on the album are the inspiring, anthemic “Iron”, which harkens back to one of their classic tunes, “See Who I Am”, in terms of the strong, fist-pumping, energetic melody; the catchy single “Sinéad”, which has an industrial beat, a strong yet sweet vocal performance from den Adel, pretty synths and orchestral background sounds, and a truly uplifting chorus that instantly lodges itself in your brain; and the penultimate track (standard edition), and “A Demon’s Fate”, which is a strong, fast track that is also has a great chorus and is melodically similar to another fine song of theirs from the past, “Hand of Sorrow”. In fact, all the songs possess incredibly strong, tight melodies and incredibly catchy hooks and choruses that refuse to get out of your head. Other standout tracks include the heavy “In the Middle of the Night”, first opening song “Shot in the Dark”, which sets the tone of the album quite well, and the epically dramatic and bombastic “Murder”. Two of the three standard edition ballads, “Fire and Ice” and “Lost”, feature incredibly moving and emotionally raw performances from Sharon and, again, memorable melodies. The bonus edition track “The Last Dance”, a must-have, is actually the best song in this collection. It is the track that is most similar to any of the band’s older songs, a soft ethereal ballad with beautiful, romantic lyrics that does not fit in with the concept of the album but nevertheless is as good or better than most of the album’s strong tracks. Fans of “old” Within Temptation will definitely like this song by far. The band, at least in my view, as someone who has liked all of their albums in some way or another (except debut album Enter, which possesses truly grating instrumentation), has somewhat sacrificed their unique je ne sais quoi and style of song composition and playing on this album. In certain areas the band’s change serves them extremely well: the instruments are all infinitely more proficient and skilled, and the orchestra has been coordinated with the band properly, and each song is stronger. However, the songs are indeed more conventional and less eccentrically unique, a fact which may alienate some fans of the band completely. (I for one am glad that the band chose this style as their new direction and their new sound; The Heart of Everything II would have been a total disappointment. The band, by choosing a more conventional rock sound, has actually taken the bravest path possible.) In addition, the album is not without lesser songs. The promotional song “Where is the Edge”, which is unfortunately sandwiched between “Iron” and “Sinéad”, is most similar to the slightly dragging, lethargic sound and generic “dark” lyrics of The Heart of Everything and is probably the closest the album has to a filler song. The first single “Faster”, while another good song, pales in comparison to the rest of the album and seems to have directly lifted the melody from “Wicked Game” by Chris Issak (and hearing H.I.M.’s cover of the latter song made this comparison even more evident). The closing song “Stairway to the Skies” is the weakest ballad by far, and is also rather forgettable in comparison to the rest of the album. In general, unfortunately, the ballads on the standard edition of the album pale in comparison to some of the better Within Temptation ballads and lack the ingenuity and tenderness of the early ballads by the band. In addition, Sharon den Adel’s vocal performance will disappoint fans, as while it is still as alternately powerful and tender as ever, the album lacks her full, interesting range which has not truly been seen since Mother Earth. The production of the album also occasionally over-processes her voice and adds rather irritating “ooh-ooh oh oh” vocal effects in the background of songs. In addition, as I mentioned earlier, the story is needlessly complicated and is impossible to understand without taking in the supplementary materials. The lyrics, aside from “Sinéad” and “Murder” which details Sinéad’s duty as a sort of avenger, aren’t specific and don’t really tell the story or give much detail or backstory into the lives of these redeemed sinners. In fact, the lyrics are not really as unique on this album, with the exception of the exhilarating, encouraging lyrics of “Sinéad” and to a lesser extent “Iron”, the emotion and pain in the lyrics of “Lost” and “Fire and Ice”, and the purely lovely lyrics of “The Last Dance”. The other bonus tracks, “I Don’t Wanna” and “Empty Eyes” are rather ordinary and not really as original or interesting as any of the album’s tracks, although the bass is audible during the beginning of the former song. Lastly, the album art is absolutely terrible and cheesy and poorly designed, drawn in a comic book style that is meant to be edgy and dark but ultimately fails to convey the atmosphere of the album. In short, this album is a total departure from the usual oeuvre of the band. Many fans of the older style won’t like it at all, but for those fans who were hoping for a brave departure in style or who just like the catchy heaviness of eighties rock, this album is definitely highly recommended! As a fan of '80s rock (and really who isn't?) perhaps I should use this album as my introduction to this band? Or maybe I will continue to enjoy the band vicariously through you and your reviews. Nice analysis of the work; I enjoy reading your comments even though I don't listen to the music! "Someone has to take a stand against evil" and by embracing a more accessible style, some might say this band clearly has. Good beat and excellent vocals. Not crazy about the themes or symphonic rock in general, but still this album could bring a few fans. I dare say that artlovermom might like a few tracks!